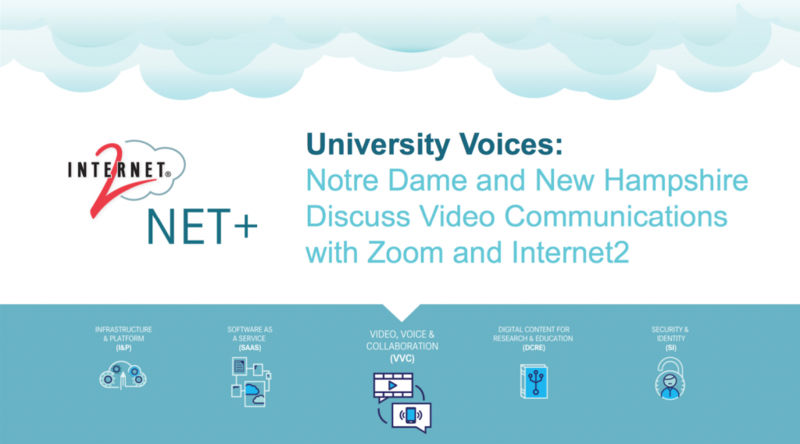 Yesterday Zoom and Internet2 hosted a webinar featuring Paul Drake, Product Manager for University of Notre Dame, and David J. Blezard, Sr. IT Manager for University of New Hampshire, discussing how they selected a video communication solution for their universities, including criteria and piloting process, and the secrets of successful deployment and adoption of technology. The webinar also featured new details of Zoom’s availability through the Internet2 NET+ program from Internet2’s Ben Fineman, and a short primer on Zoom’s education offering from our own Michele Fairbank. What are the criteria these universities used when evaluating communications solutions? What are some best practices developed from their experience deploying Zoom? Push the Zoom Chrome extension – users love it! More on these topics and other aspects of deploying Zoom in higher education are all answered in this webinar. If you’re interested in learning how Zoom can superpower learning at your educational institutions, see the Internet2 NET+ Zoom page [RB2] or sign up for a one-on-one demo with a Zoom education specialist.